Afterlife was yet another in a slew of death metal bands from the American Midwest of the early 90s specializing in an eccentric, DIY aesthetic. In stark contrast with the more renowned and professional sounding music from the coasts, these farm belt bands blurred the still-evolving edges between death metal and various other underground offshoots to create an idiosyncratic and evocative style triumphing over its obvious technical limitations. 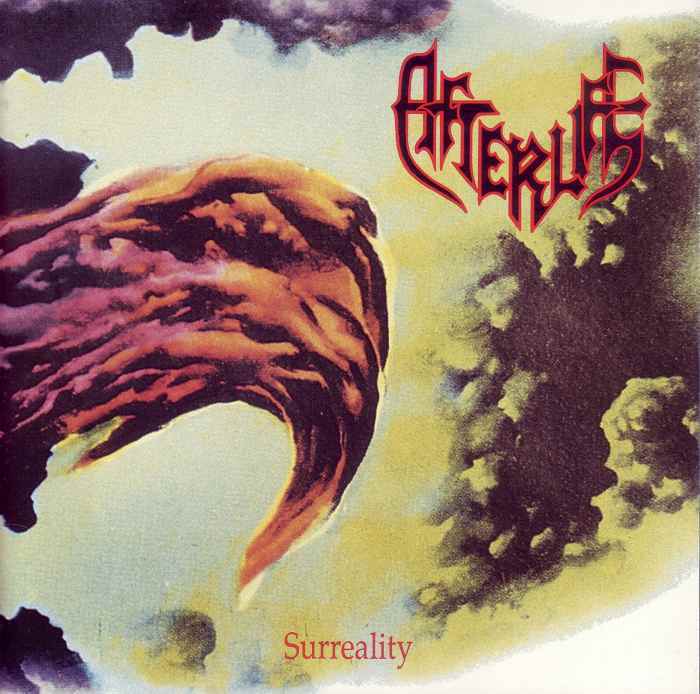 Afterlife released Surreality in 1992 and disappeared right after, leaving posterity to unearth thirty minutes of grimy death metal perennially on the verge of disintegration but somehow enduring and even thriving like the very salt of the earth from which they came. The standout feature of albums of this kind is the absence of external input in the songwriting process. On more professionally recorded albums, where bands recruit the services of knowledgeable producers, songs have a more rounded nature; excesses and missteps that may not be immediately evident to musicians are pointed out, and modifications, repeat takes, or better alternatives suggested. This sort of interference is palpably missing from Surreality, resulting in a startling array of songwriting textures; textures not always of the tonal variety, but in the sense of raw, unhinged instrumental performance. It is a jam-like, stream-of-consciousness approach to songwriting, where the ensemble sifts, even improvises, through its arsenal of ideas and on chancing upon a particularly appealing sequence throws caution to the wind and plays the heck out of it. Out of such free-spirited gestures then we get a death metal notoriously difficult to pigeon-hole but which remains surprisingly whole despite its many influences. Drummer Dave Ross drives these songs with an extroverted performance, routinely insinuating himself into situations where another drummer might hold back, imparting the sort of hypercaffeinated percussive kick one otherwise expects from Suffocation-style brutal death metal. Suffocation circa-Reincremated and Human Waste is not an inconsiderable influence, actually, heard most commonly in the lurk n prowl and grinding syncopation of the guitars, but as becomes increasingly felt through the entirety of Surreality, this was not a band content to worship at the feet of known gods, straining to strike out with ambition in more unchartered directions. This entry was posted in Uncategorized and tagged Afterlife, death metal, Indiana, Surreality. Bookmark the permalink. Can you do a blog on your favorite novels one day, or maybe on some of the books you enjoy on general? Some coincidence here that I have frequently thought of doing a post relating Jack London’s uncompromising ideology on life to heavy metal!